I pulled some stone-like (or seed-podish) elements from a painting I completed yesterday, and developed this pattern series. Living in the Southwest, one cannot help but be inspired by the silver-cradled turquoise and coral found in the trading posts' jewelry cabinets. The colors are also reminiscent of Morning Glory Pool in Yellowstone National Park. I love this turquoise pattern. 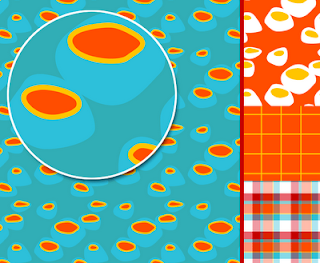 It's only in this last year that I've realised just how much I like pattern and you happen to have used two of my favourite colours - turquoise and orange.